Welcome to RTSynth a midi event triggered real time software synthesizer entirely based on physics and mathematics. NURT: number of units playable in realtime at 44100Hz, stereo. Anyway from the numbers above RTSynth should still be usable on a Pentium 200 like system. 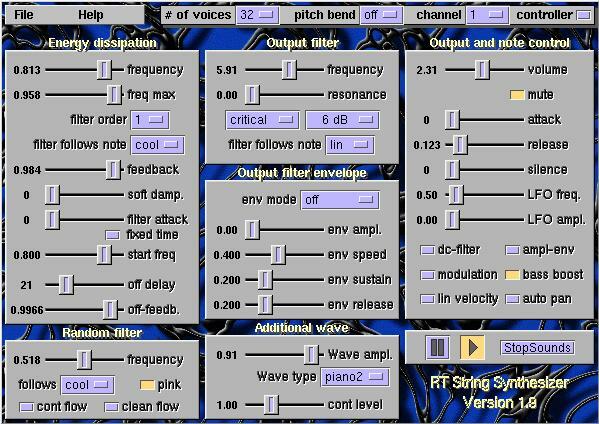 RTSynth supports a polyphonic string synth, a monophonic flute synth and a set of audio effects. It should run on any machine with a CPU/FPU performance comparable to a pentium 90 or higher. Any faster machine is welcome and will allow more complex sounds, audio effects and/or a higher number of independent voices. I hopefully did a good job in runtime optimization of the code but anyway, as with all real time applications, there is never a too fast machine. Internally all sound operations use 32 bit floating point numbers to give lowest distortion and highest possible dynamic range. RTSynth is currently developed on a Cyrix 6x86-166 (seems to be comparable to a pentium 90!) based machine running Linux v2.0.33, egcs 1.1 and glibc2. To perform well, RTSynth should be set to userid root with `chown root RTSynth; chmod +s RTSynth`. This will allow RTSynth to use the real time scheduler for best run time behaviour. After getting the scheduler RTSynth is setting back its root priority to the normal users one. 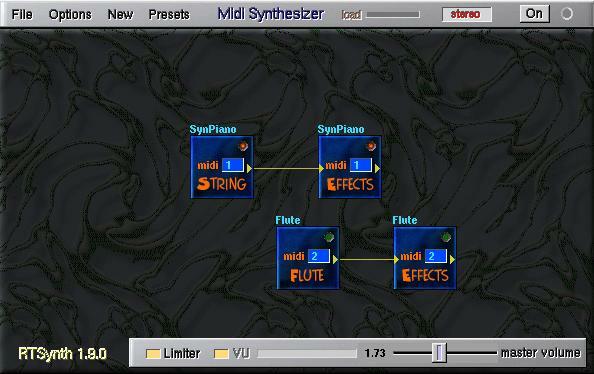 To make the choice of the MIDI input source as flexible as possible, RTSynth can read midi events from a input stream. This can be a device, a pipe (stdin) or a named pipe (fifo). RTSynth normal execution. Reading midi events from /dev/midi00. RTSynth -o /dev/mydev use the given audio output device (must be a OSS /dev/dsp compatible device). 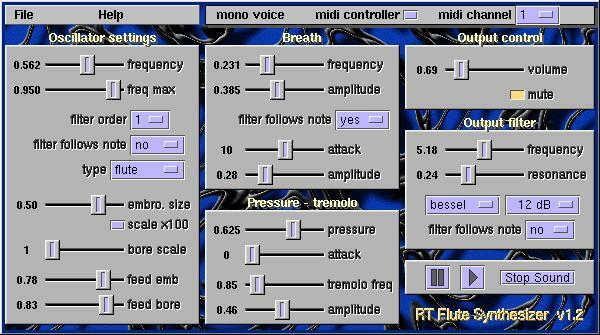 cat foo | RTSynth to read midi events form a fifo or pipe. or you can use SoftWerk a cool software "analogue" sequencer to trigger RTSynth. Known bugs: Overdriving the PM-resonator effect to hard may crash the effect. You have to restart RTSynth to get it work again. The flute synth may also crash when using some extreme settings. Loading of corrupt patch files may break down RTSynth completely. The blue edition reached another milestone on its way to version 2 -> version 1.9.0. In this version more physics can be applied to the sounds by the use of an improved physical modelling resonator. Eleminated stabilitiy problems. No more wild going flute sounds or drums that kick out their resonators. Highly improved PM-resonator effect. This multi resonator adds a body to your sounds and can also add some non linear effects of the body which depends, like with real instruments, on the playing loudness. Updated documentation about this effects as it is the most important (physical) one. The maximum number of voices has been increased to 32. Preset sounds have been updated. NOTE: The presets are for a sample rate of 44100Hz and may not sound as well on other rates. New release version 1.8.0 (code name "blue") is available for download. "Renovated" the quite old DSP core a little bit to fit to modern CPUs by removing lookup-tables and replacing approximations by their exact formulas. The application is not bound to a fixed sampling rate anymore. As there is still some work to do in the effect section the supported range is for now limited to the range 44100-48000 Hz. Audible increase of overall tuning. The string synth has now the long missing pitch bend with a selectable range of +/- 0-4 half-tone steps. A step size of zero will switch back to the old behaviour. (pitch-wheel -> filter) NOTE: As this is a somewhat CPU intensive task you should switch pitch bend only to on when you really need it! This version is for ALSA version 0.9. Added command line option to set the audio fragment size. Improved tracking of pitch-bender in string and flute synth. Added optional "auto pan" mode. Added support to control synth parameters by MIDI controllers. BugFix: eliminated problems with reading from /dev/midi on linux 2.2.x based systems. Changed handling of midi NoteOff events -> eliminating possible multiple playing of the same note. Added new main-panel. You can now run several synth-/effect-modules and connect them together. Improved and scale-able reverb effect. Some minor bug fixes and runtime optimizations. RTSynth now always runs in real time mode. The problems with reading midi events from a pipe are solved by using threads. RTSynth now works fine with the "SoftWerk" software sequencer program. New features are a peak load meter that monitors the CPU/system load from the view point of RTSynth. A auto switch off function on a system overload or audio underrun. The output filter frequency (string synth) and the embouchure size (flute synth) are connected to the midi pitch bend for real time control by a external device. Some buildin preset sounds (instrument and effect). added command line optiion for audio output device. HoldPedal - only available when the string synth is set to 24 voices. PitchBend - The filter/embouchure value given by the interface slider is multiplied by two on max pitch bend and zero on min pitch bend. A centred pitch bend leaves the slider value unchanged. Support for midi "running status" used by some sequencer programs like CuBase. NOTE: For a full list of supported MIDI controllers please see the online help within the synth panels. NOTE2: Since version 1.8.0 MIDI pitch has benn implemented. You can set the midi channel and switch on/off a audio module directly from the tile by using the control elements shown in the picture. Pressing the left mouse button on the audio output symbol and dropping it over the target tile will build a connection. Doing the same process between already connected modules removes the connection. Left/right mouse button over the midi channel field decrements/increments the channel value. Circular connections between modules are not allowed and will be rejected by the program. Pressing the right mouse button opens a context menu. Any module with a output that is not explicitly connected to another one is connected to the main output by default. as the name suggests this synth is mainly designed to produce string like sounds. But it is not limited to that. You can also use the string synth for example to produce a sinus wave sound or together with the resonance able low pass filter some cool synthetic sounds. It is a polyphonic synthesizer with up to 24 independent voices based on the so called `physical modelling synthesis´. Because the base algorithm does not have much to do with the physics of a real string instrument (the interaction between the string, the instrument corpus and the players fingers are much to complex to be calculated on a PC in real time), I call it the `energy dissipation model´. The maximum number of playable voices of course depends on the speed of your machine, synthesizer settings like filters and the number and type of activated audio effects. 1. We want a clean sinus wave -> Wave ampl. = 1, Wave type = sin. 2. The sine wave should have a constant amplitude. This is meet by setting all damping parameters in the Energy dissipation panel to "no damping" -> frequency = 1, freq max = 1, filter follows note = no, feedback = 1, filter attack = 0, off-delay = 0. It is a little bit hard to set the feedback to a value of exact 1.00, soft damp. can help in do it for you by setting it to a value greater zero. 3. Normally a sinus sound needs no output filter but as you can hear on some notes there is some noticeable distortion. To reduce it we use the Output filter with filter follows note = lin, frequency = 1 (filter any frequency higher than the base octave), bessel, 12 dB. You may also use a small resonance value (0.1) to get a even sharper filtering. 4. Now, we want to apply a conventional amplitude envelope to the sinus wave to get a short percussive sound. The Output filter envelope can be used for that -> env mode = normal, env ampl. = 0 (we don't want a filter sweep), env speed = 1 (fastest attack), env sustain = 0 (no sustain at all), env release = 0.2 (short sound). And last but not least in the Output and note controlpanel the ampl-env must be activated. 5. We modify the sound now a little bit. For the wave type we choose an unfiltered rectangular wave (crect) an apply an output filter envelope by setting env ampl. to 1.4 and to make the sound a bit more interesting we apply a value of 0.3 to the output filter resonance. To apply note velocity to the filter sweep amplitude we switch the env mode to accent., to ampl. if we want the note volume to be independent from the note velocity, and to speed if our intention is to modulate the envelope speed by the note velocity. To have a sustained sound again we can switch the ampl-env off. 6. to produce a more string like sound we switch the output filter to off, the ampl-env to off. Set the Wave ampl. to 0.5, the Random filter frequency to 0.53, its filter follows note mode to "cool" and let Energy dissipation do the decay stuff by setting: frequency = 0.68, freq max = 0.89, filter order = 1, filter follows note = "cool". To have a slowly decayed sound off delay = 30, off-feedb. = 0.998 for example can be set. 7. now we switch the Output filter on again to have a some what different "SynthBass" sound than in Step 5. The string synth panel is subdivided into smaller panels sorted by functionality. The random filter is used to filter the noise source output and may also be used to filter the output of the additional wave. The filtered random noise together with an additional wave are used to initialize the oscillators starting wave form. The usage of a random noise amount to produce a wave form makes the sounds generated by the string synth quite different form the static sounds generated by sample based synthesizers. Like for a real string instrument the produced sound will never be exact the same even when playing the same note. In addition to the noise source the output of the additional wave unit can be used to build the starting wave form. This panel includes a mixer for the balance between the random noise and the additional wave amplitude. Here the generated wave can be filtered by a resonance able low pass filter. Settings for an output filter and/or amplitude envelope can be done here. Each String Synth voice has only one envelope generator but it can be used for output filter and amplitude modulation. Sound volume, amplitude attack, decay, amplitude envelope and more can be set here. freq. max Highest cut off frequency. A value of 1 is equal to infinite. filter order Setting the damping rate of the energy dissipation low pass filter. filter follows note no fixed filter frequency. yes filter frequency follows note value. Higher note gives higher cut off frequency. cool,usr1,usr2 filter follows note value non linear. soft damp Starting with the value given by `feedback`. Reduce damping until a feedback value of 1 is reached. If ´off delay´ is in use the ´off-feedb.´ value will be used after the ´off delay´ time has been reached. A value of zero means, disable "soft damping". filter attack Attack time is given in number of periods. (´fixed time´ off). A value of zero means disable ´filter attack´. At the end of ´filter attack´ time the filter frequency value given by ´frequency´ is reached. fixed time Interpret the number given in ´filter attack´ as a fixed length time, independent of the note value. start freq The frequency of the energy dissipation filter used by the ´filter attack´ as the starting value. off delay Time in periods until the ´feedback´ value is replaced by the ´off-feedb.´ value. A value of zero means, disable ´off-feedb.´. off-feedb. Damping value used after the time given by ´off delay´ has been exceeded. frequency Cut off filter frequency used for the noise source and wave given by the Additional wave panel. filter follows note For description take a look at Energy dissipation panel. Wave ampl Mixer for the amplitudes of the wave given by ´Wave type´ and the filtered noise source. A value of zero means only noise and a value of 1 only wave as source. Wave type The wave type. The choices "crect", "csaw" and "ctri" are the same as their counterparts without the leading "c" but will not go through the Random filter. "piano", "piano2", "metal" and "sawres" are a little bit more complex wave types and functions. cont level Amount of continous energie that flows into the system. cont flow Enable continous energie flow. clean flow When enabled the amount of energie has the "clean" time shape of the selected ´Wave type´. frequency Cut off frequency of the low pass filter. This value can be altered in real time by the midi pitch bend. resonance Amount of filter resonance. filter type critical critical filter characteristics. bessel filter with Bessel characteristics. butterw " " Butterworth "
tscheby " " Tschebyscheff "
tscheb3 ditto with 3 dB cut off resonance. NOTE: The filter types are only correct for filters without resonance. filter order off filter off. 6, 12 , 24 dB Low pass filter with the given damping. +12, +24 dB Mix of filtered and unfiltered output. filter follows note no filter frequency is fixed. lin filter frequency follows note. A value of 1 means same octave as the played note, value = 2 one octave higher ... NOTE: This values are only approximate. usr filter frequency follows note value non linear. normal envelope speed and amplitude are independent from note velocity. accent envelope amplitude depends on note velocity. acc.inv ditto but with inverse dependency. ampl. like accent but the note velocity only affects the envelope not the volume of the played note itself. a. inv ditto but with inverse dependency. speed like ampl. but now the envelope speed depends on the note velocity, note volume is constant. s. inv ditto but with inverse dependency. env ampl The amplitude of the envelope. Setting this value to zero will disable the filter envelope but has no influence to the amplitude envelope behaviour. env speed The attack speed of the envelope. A value of 1 means no attack phase. env sustain The sustain time of the envelope. env release The release speed of the envelope. volume The amplitude of the played sound. attack The attack time of the amplitude envelope. A value of zero means no amplitude attack. release The release time of the sound after receiving the `midi note off` event. silence The number of "silence" played periods of the sound. Will normally give a more soft attack sound. LFO freq. The frequency of the amplitude envelope LFO. LFO ampl. The amplitude of the LFO. A value of zero disables the LFO. dc-filter A filter to reduce the DC part of the generated sound. Normally not needed. ampl-env When set, the "Output filter envelope" can also be used as a input for the amplitude envelope. modulation Some kind of modulation applied to the sound. bass boost This will boost the amplitude of low frequency notes. auto pan Adds a stereo placement to the sounds. lin velocity Selects a linear MIDI velocity to amplitude mapping. RTSynth has seven hard wired audio effect units. The distortion effect has a soft mode, emulation of a tube like distortion, and a normal mode for a transistor like distortion. This universal filter can be used as a LP, HP or BP filter. The filter order can be set from 6 dB to 24 dB. It also supports a simple filter sweep function. The PM resonator gives you the possibility to add a "body" to your sounds. It is a multi resonator with a non linearity on higher input levels. As you can see from the "PM resonator" panel/table, this effect has alot of settings to play with ;) Just as in real life you can tune the PM resonator in such a way that some notes will sound "dead", so be careful ... but usually the PM resonator is a good friend in making your sounds more reach and full. Please use one of the settings from the presets as an starting point to get somewhat familiar with this effect. feed Amount of feed back. The resonator will start to oszillate when set to high values. (good values are around 0.5) High values may be useful in finding a resonance mode setting. feedfreq Controlls decay of high frequencies and therefor the sound characteristics of the effect. Real physical resonators like a guitar body have a fast decay of high frequencys. Anyway a very low value will supress any resonance on higher notes. Intensity Here the amount of the continous "energie flow" through the resonator, which is necessary to get some resonance, can be set. Good values are 0.6-0.8. Other values may give higher non linear effects. Input gain This effect has a limit for the maximum input value. Before this limit is hit the effect becomes more and more non linear. The input gain control allows you to down/up scale the input value. Be careful at very low gain values the movement of other sliders can generate quite loud noises as in this case the output gain is set automatically to very high values. efx vol. The volume of the effect. efx only When switched on only the effects signal will pass through but not the original one. Properly interesting when cascading several resonators. mode fine Fine tune of current reso. mode value (+/- 15%). scale x20 Multiplies reso. mode by value of 20.
frequency The base resonance frequency of the resonator in Hz. freq. fine Fine tune base resonance frequency (+/- 10%). This is an equalizer with a bank of five band pass filters. Setting a filter to a value of zero disables this filter and therefor saves CPU time. The well known chorus effect. A simple reverb effect. In stereo mode two reverbs, one for each channel, can be mixed to give a more complex effect. The delay effect can operate in stereo mode to give a ping-pong like effect.